Sometimes team building is taxing for leaders but it’s always worthwhile. On the tough days, everyone deserves a pep talk. If you need one today, choose your favourite from these 115 team building quotes and remember Team Bonding has your back! A team is more than a collection of people. It is a process of give and take. – Barbara Glacel & Emile Robert Jr.
You’ve been given the job of choosing a fun teambuilding event and you want to choose something that everyone will enjoy. All the events sound really good but how do you know do you know if your teambuilding event manager would deliver a great event? 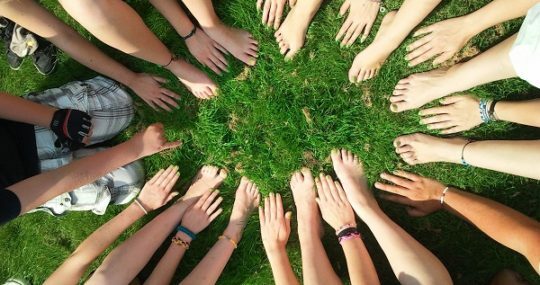 Here are the key questions you need to consider before choosing a team building company. Will the activity be genuinely enjoyable for your team? The Director of Team Bonding, Cate Richards, is pleased to announce their latest innovative offering for team building, Taste Food Tours (“Eat for a Good Cause”). The tours are conducted in partnership with the Benevolent Society, and run as a social enterprise, which means that the profits of the initiative will help to fund social programs. 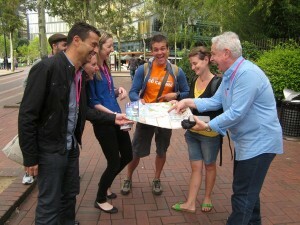 The new Taste Food Tours are to be offered in 2013, and compliment the business’s existing range of popular corporate team activities and events. 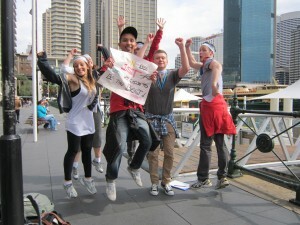 As part of our corporate Amazing Race in Sydney and Melbourne, participants are asked to undertake our charm challenge. This includes having to find a worthy recipient of a random act of kindness. I thought it would be fun for our readers to hear about a sample of the RAOK’s that we’ve seen during the event. 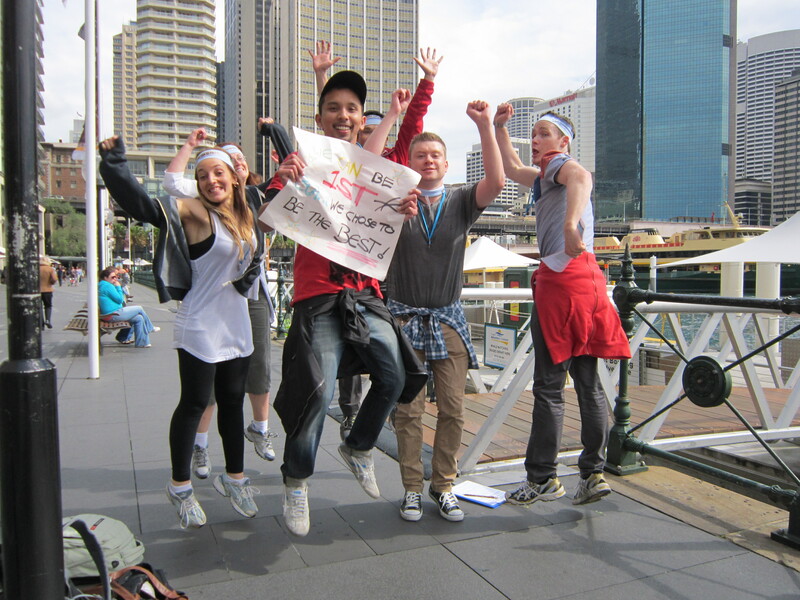 See teams in action enjoying the Amazing Race in Melbourne. With warm up games in the beautiful Botanic Gardens the course includes Southgate, the laneways of Melbourne, including the fabulous Hosier Lane, the Cathedral and all the fun of Federation Square. With a brilliant choice of finishing venues, you will see that this is the team building event your team will love. So, you have a teambuilding activity in your diary and you want all that winning kudos to go your team’s way……but how? 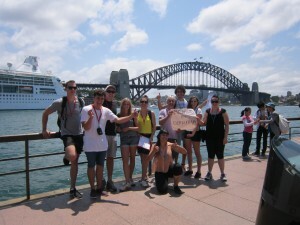 What makes for a winning team on a corporate team building exercise? Creativity is the new currency. As consumer appetite for new technology and innovation grows, the challenge rests upon the shoulders of businesses to find new ways to adapt to these changes. And these changes are no longer confined to Silicon Valley. The challenge to find new ways of doing things has spread all over cities like Tokyo, New York and Sydney. Teambuilding is an ideal activity to foster creativity among leaders and the workforce. Henry Ford is widely acknowledged for inventing the automobile and the assembly line. When people graduate from university and enter the workforce, they think that they will leave cliques behind. The reality, however, is that like-minded individuals inevitably band together and spend time with one another. Not to say that cliques are altogether bad, but as a manager, your end goal is to have your team work efficiently and effectively together, regardless of personality.